I was delighted when Jeni of In Color Order sent me this gorgeous creation to quilt. So much negative space to play with! The prints are from her own line Color Me Retro with Art Gallery Fabrics. 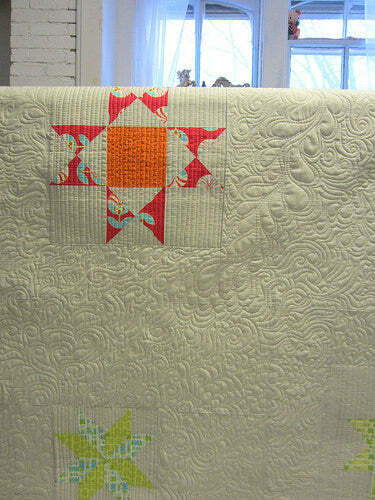 The quilt pattern is called Shining Stars and it is Jeni's design. I believe she will be releasing a pattern for it soon--- I will update this post with a link when she does. 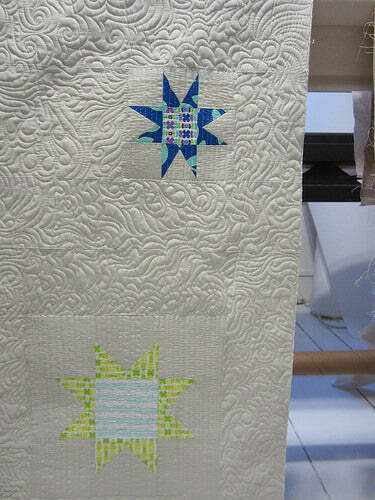 I have a new page about my longarm quilting services which you can check out here if you like! I really love longarm quilting. It's so much fun. That, and I finally watched the last season of Dexter--- which was AWFUL. And maybe drinking some fireball whiskey now and then. Have I even told you about this yet? Ah! I have so much to catch you up on! Soon.